Pentax Corporation has announced the Optio E30 compact digital camera in advance of its debut at the Consumer Electronics (CES) Trade Show that organized by Consumer Electronics Association in Las Vegas from 8 to 11 January. Named for the easy-to-use line of PENTAX compact digital cameras, the Pentex Optio E30 offers 7.1 effective Megapixels for exceptional high-resolution photography. The upgraded 7.1 effective Megapixels, the one of the most in the entry-level class, enables user to take pictures with outstanding resolution. The Pentax Optio E30 digital camera also features a 3X optical zoom lens with a focal range covering angles of view equivalent to those of a 36-108mm lens in 35mm format, which is ideal for a broad spectrum of subjects from landscapes, through sightseeing photographs, to portraits. The design of Optio E30 comes with AA battery compatibility. This allows it to capture approximately 200 photos with alkaline batteries or 760 shots with lithium AA batteries. The Optio E30 comes with the Green mode, which automates the camera setup when shooting still images, that allows even complete digital-camera beginners to enjoy picture-taking effortlessly. A single button press automatically sets the exposure, sensitivity, white balance, and other parameters according to the shooting conditions. This function is useful when asking someone else to take your picture or when you’ve simply lost track of the camera settings. Selection of shooting and playback modes is made much easier with the Mode Palette, PENTAX’s original mode-selection function that lists mode icons on the LCD monitor. By arranging 15 shooting modes, including Landscape, Pet, and Food, and 8 playback modes, the Mode Palette speeds up mode selection with its straightforward display and guide function. 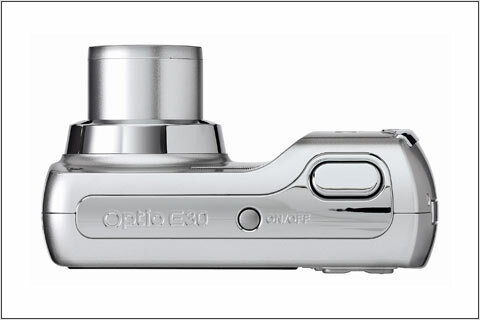 The Optio E30 features a 3X optical zoom lens with a focal range covering angles of view equivalent to those of a 36-108mm lens in 35mm format, which is ideal for a broad spectrum of subjects from landscapes, through sightseeing photographs, to portraits. Such zooming power can also be combined with 4X digital zoom to achieve a total of 12X zoom capability. The Optio E30 manages to fit in a large, 2.4-inch LCD monitor despite its compact body dimensions. Not only does the monitor’s size make it easier to compose and play back images, it also permits easier operation and setup thanks to its larger, easy-to-read menu display. The Optio E30 is compatible with the ImageLink printing system. By simply placing the Optio E30 on the printer’s dock of ImageLink-compatible printers, the user can take advantage of printing of recorded images, without requiring a personal computer. 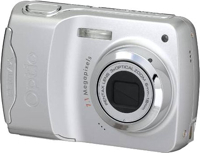 The Optio provides 11MB of built-in storage memory, NTSC / PAL video and USB data connectivity, a built-in flash and a macro mode that allows focusing as close as fifteen centimeters. The Pentax Optio E30 will be available in February 2007 for $149.95.